My daughter (13) loves it and I love that it's just a deodorant and it actually works! She's been using it for a couple years (since she was 11). Only this year has she had to re-apply after gym or soccer, but other than that, it's great for her. I've been using drugstore deodorant as long as I can remember, and my armpits started to break out into little red painful bumps. Nothing would make them go away. But I decided to try natural deodorant and this one was recommended by a friend.. and in less than a week all the bumps under my armpits are gone! It smells nice too. You do have to reapply more but it's worth it in my opinion. I would definitely recommend! Unfortunately this didn't work long for me. I have to reapply even in the winter about halfway through the day. Bummer because my husband loves the guy one. Wish I could say that I loved it but honestly I didn't. I've purchased many natural deodorants over the years and had high hopes for this one. Unfortunately for me it makes my armpits sticky, lucky to last an hour and gives me a weird B.O. So after a months use I'm sad to say I won't be repurchasing or continuing using this deodorant. Love it!!! I have tired a lot of natural deodorant's and this one is the only one that works!! I have tried A LOT of natural products and this is the absolute best! The scent is light and this product works all day! I needed to find another alternative and so I decided to try this product... the powder smell was what intrigued me! Truthfully, the deodorant smells fantastic BUT doesn't last longâ€¦ If you are making the switch to all-natural from years of using regular deodorant, might I suggest that you REAPPLY FREQUENTLY. It works! Promise! I've been using natural, non-aluminum deodorants for 25 years, and nearly all of them have been so-so when it comes to odor control. I've just sort of accepted that they don't work as well as regular deodorants. 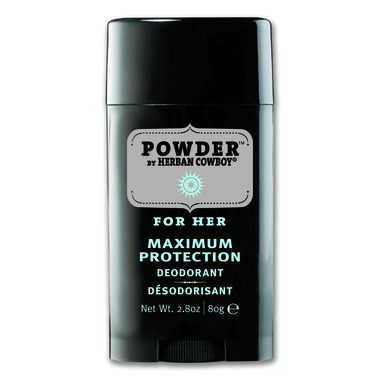 Well imagine my surprise when I branched out and tried this kind on a whim -- and found that it TOTALLY works as well as any mainstream deodorant! I've been using it throughout this summer with ZERO problems (and I never reapply during the day). Just fantastic. I'm totally "sold" on this and will continue to use. awful product. I love herban cowboy products and was disappointed when this deodorant did not work at all. Would not recommend anyone to buy this. A favourite of mine! The blossom scent is also lovely, however I recently tried powder and I love it! Gives a nice light scent and keeps working throughout the day (may have to reapply by evening). Even though you're paying a bit more for this product, it's worth it! Best Natural deoderant line! The men's one (Herban Cowboy) is to die for. I LOVE it on my husband. But this one is perfect for women. Has a nice smell and lasts all day (unlike other natural deoderants, and I have tried a LOT). I have just ordered the other one for women and will review once I try! This is the first natural deodorant I've tried that actually works - others I've tried and about 1/2 hour later I can smell myself even if I'm not sweating. This one seems to work for me all day at work and only starts to wear off by about the evening, which is what the non-natural deodorants do for me. I would recommend spending the extra money on the Herban Cowboy natural deodorant. The best ever! I've tried many natural deodorant. Some were gentle for my skin, others were good against bad smell, but this one does both! The man deodorant is wonderfull for my man too!